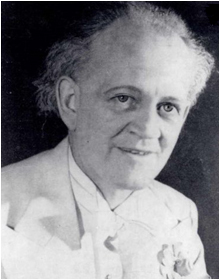 Featured in this week’s History of Magic is Edgar Wilson Benyon. New Zealand, being such a small country with a population of sheep and possums that far outnumbered the inhabitants, was where Benyon was born in 1901. He became known as the Great Benyon, the finest magical performer the country ever produced. Benyon was a man of many talents, beginning as a juggler, fire eater, and ventriloquist and was to add the further talents of mimicry, balancing, paper tearing, magic, mind reading and illusion and was mostly self-taught. From simple magic tricks, he became an extremely versatile and very skilled performer who worked at an incredibly fast pace. His act became known as the “The Same Man Different Clothes Act” because of the number of quick change costumes and clothes in his show. He saw adversity as a challenge that he seemed to always overcome. Early on he was an apprentice printer to his father’s printing business who often received free passes to various shows because of the playbills his father printed. So Edgar Wilson Benyon was exposed to theatre at an early age that began the incentive to become a stage magician. He married and had two daughters who all became involved in Benyon’s travelling shows right around New Zealand. Because of his extreme versatility as an all-round performer, his shows became incredibly popular at a time vaudeville was still an attraction. He would begin his show with fire eating, balancing a billiard cue on another billiard cue, juggling, and magic tricks. He would then disappear off stage reappearing seconds later with a different costume on. Then would follow his mimicry act with bird and animal sounds. He was a fine singer, song writer, and Xylophone and trumpet player. His show featured songs by his wife and daughter, as well as dance interludes. Benyon had a world accomplished accordionist and comedian added to the bill. New Zealanders had never seen such variety and talent in the one show before. He toured Australia, India and the United Kingdom and became a firm favourite in Ireland where he spent many years both as a stage and tent show entertainer with a show called, “Bam Boo Zalem”. His tent show holding 2000 spectators featured plush padded seating throughout and 25 tons of equipment and props carried by trucks. His show was one of the largest at one time and, with his varied skills as a solo performer always drew full houses. His daughter and wife danced in the show that comprised of magic tricks, illusions, and music with as many as 14 scene changes. Between acts he would disappear off one side of the stage only to reappear moments later from the other side in a completely different theme costume to perform again in a completely stage different setting. A typical performance would open with a Chinese background and chorus, Benyon would sweep on stage to perform a series of fast paced Chinese themed magic, dressed as a Chinese Mandarin. Then he would run off stage to return seconds later dressed as a Japanese juggler, juggling balls, cigar boxes, large rings, and tennis racquets, then spinning and balancing billiard cues, (An idea taken from Maori stick games). This climaxed with a huge production of sunshades and spinning brass bowls. Off stage again he reappeared dressed as an Arabian Prince to perform, ‘Where do the Ducks go, Egg on Fan and the Substitution Trunk’. He next appears as a fully dressed Red Indian complete with feathered headdress to bewilder with the Totem Pole escape, the Razor Blade trick, the Rapping Hand, and Sword Box. Next we see him dressed in Dutch clothes, with his daughter Evelyn performing a Clog Dance, followed by his mimicry act and paper tearing. 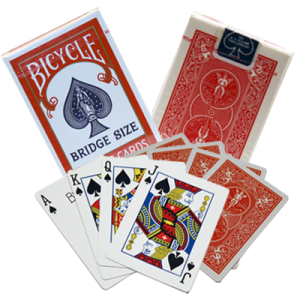 One of his features was his clever use of a paper trick called Troublewit. He created rag pictures of scenes in Holland. In the next scene he appears as a French artist then with lightning speed proceeds to draw cartoons, and funny caricatures finishing with a large, beautiful painting that only becomes obvious with the very last brush stroke. His illusions also included The Divided Lady and P T Selbit’s Sawing in Half. Later on he was to introduce a huge Wurlitzer Organ to the travelling show that was a real crowd pleaser that enhanced his shows. Organ music was often used by magicians. The show proceeds at a faster pace, quicker scene changes and different costume changes, as a gentleman in tails, top hat, cane, gloves and cape. Next he becomes a cowboy, then a Russian necromancer, a Spanish matador doing rope spinning and more juggling. He then transforms into a palace guard complete with bearskin hat with more magic tricks and ventriloquism. His dummy is dressed the same way. It’s a whirlwind of mystical wonder and amazement, as the great Benyon and family troupe bewilder and amaze. His grand finale featured the ‘Jungle god Illusion’, a magic playlet with the whole cast and the vanish of a lion on stage. Alternatively he ends his act that fills the stage with flower productions everywhere. After again touring Britain, Australia and Ireland he again meets up with the young Billy McCombe whom he had befriended as a young lad on his earlier tours. This was to have a big influence on Billy’s own magic career. During this period Benyon managed to buy up whole acts of retired illusionists to add to his Bam Boo Zalem sho w. He returned to New Zealand in 1946 but continued to tour his tent show around New Zealand through the 1960’s. After 60 years as an entertainer, at his Diamond Jubilee, the magic and theatrical fraternity of New Zealand hosted a special ceremony in his honour. 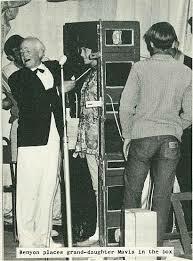 A little later he was honoured with the very first Grand Master of Magic Award while the Variety Artistes Club of N.Z. presented him with a special ‘Benny Award’. In 1973 he was invited to appear in Japan for the huge World Surprise Show. He passed away in 1978 but is still fondly remembered for his great artistry and contribution to magic and the allied arts he was so good at. The Great Benyon was a wonderfully, capable performer of the highest calibre who has influenced many Kiwi magicians. This is probably why there is such a high standard of magic in New Zealand today. His contribution is well-recorded for posterity with many lessons to be learnt by other magicians. 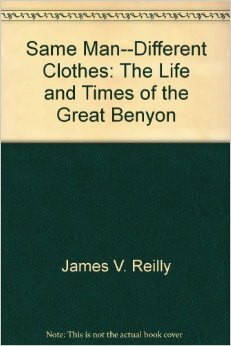 Magic historian and former editor of N.Z.Magicana Magazine James Reilly has recorded the life and times of the great Benyon in his book “Same Man Different Clothes” (ISBN # – 9597986 -1-7) which is a marvelous read and highly recommended. This book has a lesson on almost every page. You can read more about this highly talented magician illusionist on Wikipedia. A performer whom the Irish referred to as the Magical Irish Leprechaun. The Great Benyon’s legend lives on today and in the long and colourful history of magic.